Quiltville's Quips & Snips!! : Galaxy-Gram! Hello, Ketchikan! 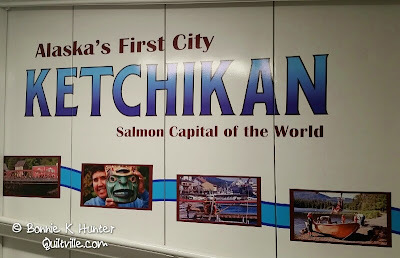 Here I am in Ketchikan Alaska at the end of a very long and many-hexied travel day! Mary picked me up at the airport and we took the ferry back across to town to check me into my hotel, grab a bite of dinner, and tuck me into my room. My brain is too tired to think, my fingers too tired to type a long blog post, I am going to head to bed hoping I don't wake up at 3 a.m. And catch you all up tomorrow! 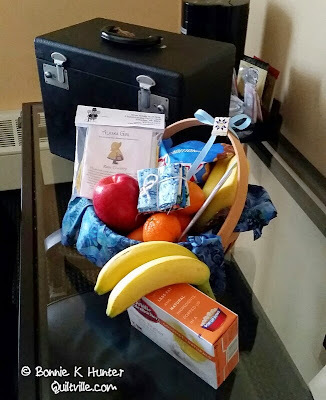 The guild is already taking very good care of me, there is a goodie basket with healthy munchies and a very familiar little black box complete with a feather weight for hotel room selling. Thank you ladies for being so thoughtful! 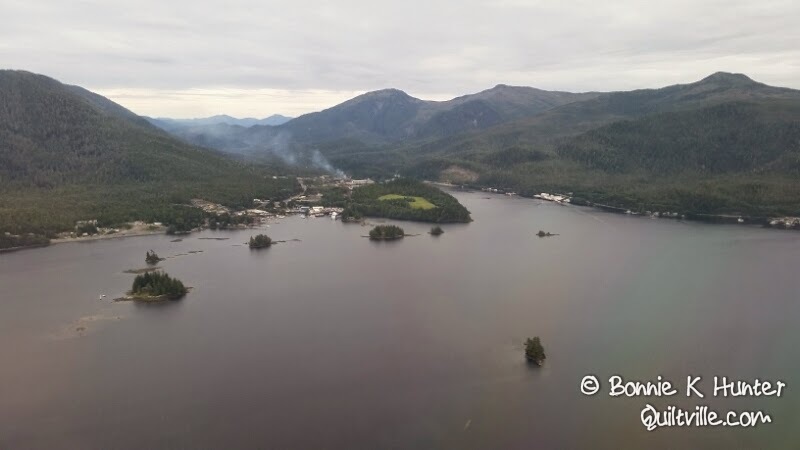 I give a lecture tomorrow night, but the day is free so I have a hike planned and lunch out on the agenda just spending time in Ketchikan with the locals and getting to know the area a bit better. Good night, Ketchikan- I am so glad to be here! So glad the welcome was so warm. Sounds like you needed it after a long day. what fun! what is the tiny package with the sunbonnet sue...? was the last trip to Alaska the Orca Bay inspired trip? What is your most favorite thing to do in new places? Antique mall hunting or something else? Alaska is beautiful! We visited our son in Petersburg last year, which isn't too far away from where you are. Have a great trip! Have a great time, it is a long way from Australia, we loved it in June......I want to go back! How sweet to be welcomed with a fruit and snack basket, a featherweight and some fabric. A quilter's welcome! I wish I were there with you. Alaska is #1 on my bucket list to see. The vast beautiful country with gorgeous views and wild life. Oh yeah! They sure know how to look after you, food and machine included!!! Enjoy your visit. Glad you had a warm welcome! We'll be in Ketchikan on the 27th during a cruise. I'm checking out shops you visited the last time you were there and posted. Odd question, are you allowed to sew during the flight? I looked up TSA rules and less than 4" scissors are OK, but they were not clear about sewing needles. What a sweet welcome!...is that a little bundle of fabric! very thoughtful! and fun! Looks like a beautful place...love all the pics you'be posted so far! Have a good time! (I'm so jealous...wish me and my featherweight were there with you.! ) :) Happy for you though!